If you would have asked me a year ago who my favorite illustrator was, I would have emphatically told you “Mike Rohde” while pointing to my cubicle wall covered in his illustrations. Calling me a “fan” would have been an understatement. If you would ask me the same question today, I would have the privilege of saying “my friend, Mike Rohde”. I met Mike in person earlier this year and we set upon a journey to turn his successful book, The Sketchnote Handbook, into a full-day workshop, complete with presentations, activities, contests, and more. I put my Instructional Design and Andragogy caps on to create a curriculum that would hopefully make Malcolm S. Knowles proud. Of course, having incredible source material made the process all-the-better. Today, all the planning became a reality. 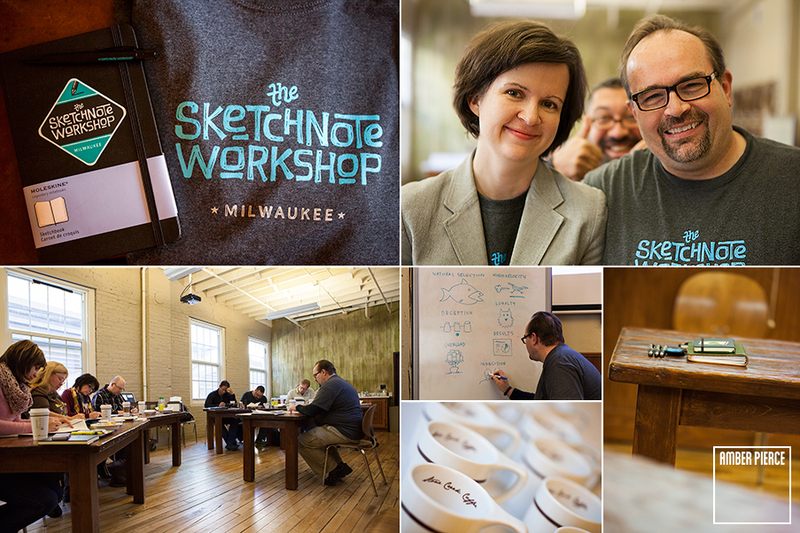 We held The Sketchnote Workshop in Milwaukee at the fantastic Stone Creek Coffee cafe. As the pilot workshop, we limited attendance to 8 so we could gather valuable feedback and enhance the course even further. The participants were amazing, the day was amazing, and I feel very honored to have helped produce such an event. I cannot wait until the next workshop!